The Torah community of Far Rockaway-Lawrence has been plunged into mourning with the passing of Harav Shmuel Shmelke Rubin, zt”l, the Sulitzer Rebbe. He was 88 years old. The Sulitzer was the son of Harav Yaakov Yisrael Veyeshurun Rubin, Admor of Sulitza-Sasregen, and Rebbetzin Alta Nechama Malka (nee Dachner), Hy”d. The maspidim at the levayah all spoke about the influence the Rebbe had on the neighborhood mosdos and the entire community. “But how did he do that?” asked Rabbi Avraham Kleinkaufman a leading mechanech and author. “The passuk says, ‘V’avad haLevi hu es avodas ohel mo’ed v’hem yis’u es avonam — The Levi shall do the avodah and bear their aveiros.’ The Binah L’Itim asked, ‘What does the Levi do to remove their aveiros? He just does his own avodah. How does that affect anyone else? But that is just it, he said. The fact that there is someone doing the avodah al taharas hakodesh—with total and absolute kedushah, has an influence on everyone else. This is how the Sulitzer Rebbe, zt”l led his kehillah. And it is how he quietly—almost silently—influenced the entire community around him. Another rabbi candidly said that his own son was a “child at risk.” The Sulitzer met with the boy, but never criticized, lectured or even told him what to do. Instead, the Rebbe opened a Gemara and began learning with him. From that grew a daily seder. And from that seder grew a deeply committed young Jew. All because the Sulitzer inspired rather than judged. The Rebbe changed the boy from the inside out. For himself, he was unbending. Compromise was not in his vocabulary. The Rebbe’s son, ybl”c, Harav Yaakov Rubin, shlita, said, “Er iz gekumen du in America, ober zein neshamah iz gebliben in di alte heim—He came here to America, but his neshamah remained in the alte heim. He was a purist. In all the years—since the early 1950s—that the Sulitzer lived in America, he never ate beef. The only meat he ate was chicken, and only if either he or a member of his family personally supervised everything—from the shechitah to the table. But he never imposed his personal chumros on others. He warmly welcomed outsiders, whatever their level of observance. Another campaign of the Sulitzer was his promoting speaking and teaching in Yiddish. But, when Rabbi Pesach Lerner began a Daf Yomi shiur in the shul (before his shiur took to the road—in a car of the Long Island Rail Road), the shiur was in English. That was what the kehillah needed, so that was what counted. All of the Sulitzer’s community activities were done quietly, in the background. He consciously avoided the limelight, preferring to inspire others to take center stage, and take the credit. 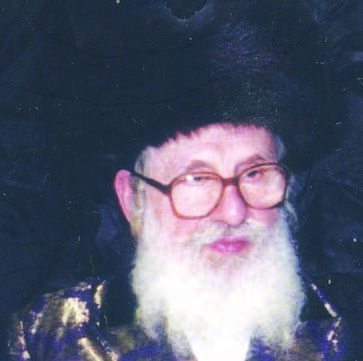 The Sulitzer Rebbe is survived by, ybl”c, his son and sucessor, Harav Yaakov Yisrael Veyeshurun shlita; and his daughters: Rebbetzin Alta Nechama Maltza Rubin, wife of the Volova Rav; Rebbetzin Dvora Hager, wife of Harav Yisrael Eliezer Hager; Rebbetzin Yocheved Rubin, Rebbetzin of the the Ropshitzer Rebbe; and Rebbetzin Rochel Paneth, wife of Harav Menachem Mendel Paneth of Dezh; his brother the Saregener Rebbe, shlita, and his sister, Rebbetzin Miral Geula Meisels.